KUALA LUMPUR: Despite the challenges and volatilities in global markets, fundraising through Malaysia’s capital market is expected to remain resilient in 2019. According to the Securities Commission (SC), total fundraising from the local equity and bond markets is projected to be in the range of RM110bil to RM120bil this year. In 2018, total equity and bond fundraising stood at RM114.6bil, which was below the regulator’s original target of RM120bil. SC chairman Datuk Syed Zaid Albar said he was optimistic of the prospects of the country’s capital market despite the external headwinds and global economic uncertainties, as fundraising activities would be sustained by the domestic economic growth. “Fundraising from the capital market will remain consistent with the financing needs of the economy,” Syed Zaid said, noting that the Malaysian economy is expected to remain on a steady growth path in 2019, albeit at a slower pace than the preceding year. “Our macroeconomic fundamentals are still strong, and our liquidity and robust capital market infrastructure are still healthy... we’ve been been growing steadily over the years, and we expect our capital market to remain resilient and orderly,” he told reporters at a briefing after the launch of the SC’s 2017 annual report. Of the estimated RM110bil-RM120bil to be raised from the capital market this year, the SC said RM17bil-RM19bil is expected to come from the equity market, with the remainder from the corporate bond and sukuk market. In equity financing, RM7bil-RM9bil would likely be raised via initial public offerings (IPOs) and the remaining RM10bil via the secondary market. “To ensure inclusive and sustainable growth of our economy moving forward, the capital market must be accessible to the full spectrum of issuers, investors and intermediaries. “It must also be agile and evolve in response to changes in the economic landscape as well as user demands. “Greater access and flexibility must, however, be accompanied by higher accountability. We will continue to raise the standards of governance and conduct, both for issuers and intermediaries in the capital market,” Syed Zaid said. Last year’s fundraising saw RM105bil coming from the corporate bond and sukuk market and RM9.2bil via the equity market. Overall, the size of Malaysia’s capital market shrank to RM3.1 trillion in 2018 from RM3.2 trillion in the preceding year. This was driven by the contraction in the equity market capitalisation, which contracted 10.8% to RM1.7 trillion in 2018 from RM1.9 trillion in 2017 amid challenging external developments. Conversely, the country’s bond and sukuk market expanded 8.8% to RM1.4 trillion in 2018 from RM1.3 trillion in the preceding year. The SC said that while the domestic stock market started the year on a firm footing, it closed lower towards the end of the year. Among the factors were heightened external headwinds from the escalating trade tensions between the US and China, the uncertainties surrounding US monetary policy tightening, the fear of contagion from the emerging-market economies and volatile oil prices. 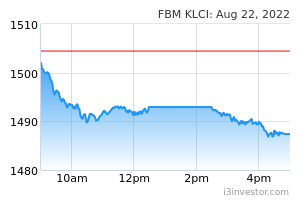 “Following a year of event-driven fluctuations in sentiment, the FBM KLCI however, remained resilient compared to global and regional markets’ performance, declining by 5.9% to close at 1,690.58 as at end December 2018,” Syed Zaid said. As for the fund-management industry, the SC said that total assets under management (AUM) for 2018 fell 4.2% to RM743.6bil from RM776.2bil in 2017. It noted that the unit trust industry remained the largest source of funds under management, with net asset value (NAV) amounting to RM426.2bil in 2018, compared with RM427bil in 2017. Overall, 79.4% of the fund-management industry’s AUM was invested locally, of which 44.2% was in domestic equities, followed by 28.5% in money market placements and 22.7% in fixed income. Meanwhile, in the alternative fundraising channels - comprising venture capital, private equity, equity crowdfunding and peer-to-peer financing – the SC said a total of RM808.4mil had been raised last year. This was indication of the capital market’s ability to play a significant role in the funding needs of under-served issuers such as micro, small and medium enterprises (MSMEs), Syed Zaid said. On that note, he said, the SC would focus on strengthening alternative financing avenues to meet the funding needs of MSMEs this year, In addition, it would focus on improving digital investment models to attract wider investor participation.